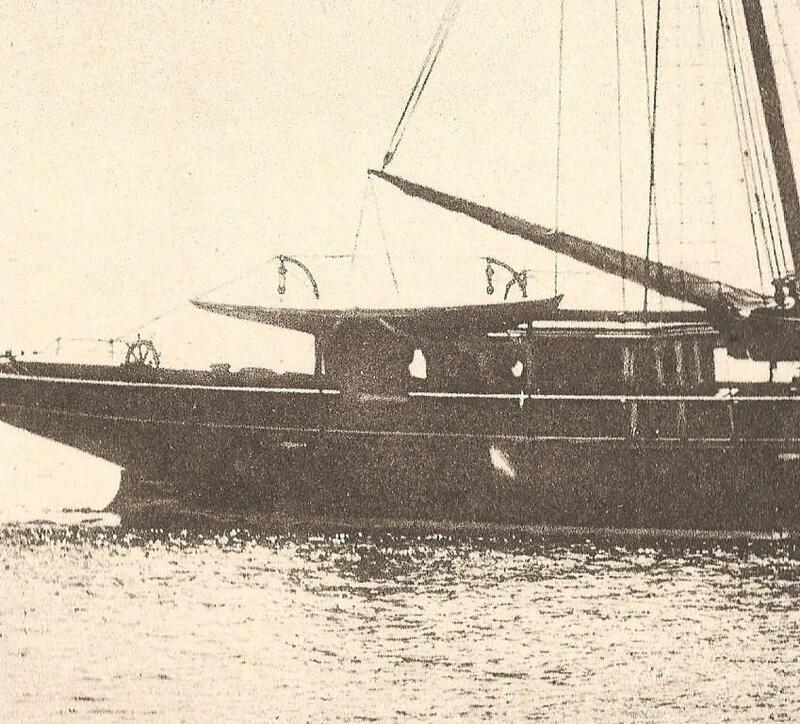 Steam Yacht Vanduara, with the ½-Rater Nita supported in her starboard quarter davits. Summer 1893. Paisley ‘thread baron’ Stewart Clark’s rakish c.200ft G.L. Watson designed steam yacht, Vanduara, poses with engines stopped. Clearly seen hanging in her starboard quarter davits is no ordinary ship’s boat. She is Clark’s son, J. Stewart’s extreme fin-and-bulb keel half-rater racing yacht Nita, built that spring to G.L. Watson’s design (no. 279) at Rosneath, Dunbartonshire – from lightweight cedar for the hull and manganese bronze for the keel fin – by another of Watson’s favourite builders of fine small boats, Peter MacLean. Given that Vanduara‘s function in life is pure pleasure, Nita adds an extra string to her bow in sporting possibilities; a diversion from one of the main functions of a Clyde-based steam yacht, apart from showing off – easy access to the lochside hunting estates. It’s just possible to discern Nita’s lead bulb here, slung low from its bronze plate. A challenging build for MacLean, just as it would have been for her designer – to engineer a strong enough but still lightweight hull shell to cope with all that lead hanging from a very narrow base. Fascinating, ground-breaking times to be a yacht designer – and a yacht builder. Note that launching is by well padded slings to Vanduara’s mainmast’s boom, with the davits merely keeping Nita securely attached to her mothership. Peter MacLean’s boatyard lay just inside Limekilns Point, at the western side of Rhu Narrows, the tide-swept entrance to the Gareloch, which is best known nowadays for its nuclear submarine base at Faslane. MacLean made his living from a combination of boatbuilding and as sometime landlord of the nearby Rosneath Ferry Inn. 1931 view over the Edwin Lutyens designed Ferry Inn, towards the J.A. Silver boatyard. Remarkably for the Clyde, the site of MacLean’s yard is still very much involved with the yachting industry, but no longer in the building of new yachts. After MacLean’s time, it was taken over by an employee, James A. Silver, who still lends his name to the present, much more recent and unconnected business – despite him being active there for only a few years before the first world war. In the early years of that war, the shrewd employment of yacht designer John Bain as yard manager saw Silvers become highly successful pioneers, then leaders in the modern marketing of series-produced, yet high quality wooden motor yachts from the 1920s into the 1960s. It’s that marketing skill which brings us back to Vanduara and her sporting combination. “This Sporting Combination”, James A. Silver Ltd advert, 1935. We should mention here our Twitter acquaintances, Camilleri Marine, who reminded us recently of Vanduara, Nita and Silvers. Remember, it’s all been done before. Even with aeroplanes. The steam yacht Vanduara was G.L. Watson design no. 115, built by D. & W. Henderson & Co., at Meadowside Shipyard, Partick, Glasgow in 1886. After active requisitioned anti-submarine duties during the first world war, she began a varied commercial career, including time as a Liverpool pilot vessel. Peter MacLean was one of a select group of Firth of Clyde boatbuilders favourited by Glasgow-based yacht designer to the world, G.L. Watson (1851-1904), to build his small to medium-sized sailing and powered yacht designs, and ship’s boats for Watson’s magnificent large sailing and steam yacht designs more often than not built at neighbouring shipyards. Read the whole beautifully illustrated story in Martin Black’s biography, G.L. 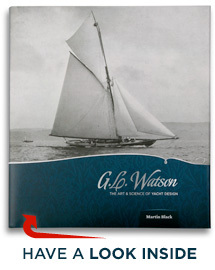 Watson – The Art and Science of Yacht Design, which can be purchased online here, or from the growing list of worldwide stockists here. This entry was posted in boatbuilders, boatyards, Clyde yachting, Clydebuilt, Firth of Clyde, G.L. Watson, G.L. Watson & Co., G.L. Watson clients, gift, Martin Black, naval architect, object of desire, other yacht designers, shipbuilding, shipyards, Steam Yacht, Uncategorized, yacht design, yacht designer, yachting history and tagged Clyde-built, D. & W. Henderson, Drumalis, Edwin Lutyens, Gareloch, H.H. Smiley, James A. Silver, John Bain, Larne, Meadowside, Nita, Partick, Rhu, Rhu Narrows, Rosneath, Silvers, Silvers Marine, Sir Hugh Houston Smiley, Stewart Clark, The Ferry Inn, Vanduara. Bookmark the permalink. I have some interest in the movements of this ship around 1910. My 3 x Great Granda Uncle, Howard Douglas Campbell Graham died of a neck injury after being found on a ship laying in the Victoria Harbour in Greenock. Confusingly the local papers lists the ship as the ‘Vanduara’, while his death certificate says it was the ‘Vandura’ and the Procurator Fiscal report says its was the ‘Valdura’. As far as I am aware all three of these names were in use as ships around this time. Does this sound like a description that would be consistent with the Vanduara? I suspect the local paper got the details wrong. Thanks for your query Colin. Not a nice end… I think the fact that he fell into a hold most probably rules out the steam yacht Vanduara. Although such vessels required substantial stowage area for stores, they didn’t have cargo ship type cargo stowage holds – although they did of course have stoke-holds for coal. Have you checked out Clydesite’s wonderful Clydebuilt Ships Database? I suspect that the Procurator Fiscal was more likely to get it right than the local newspaper, or a doctor’s handwriting… CSD offers the cargo vessel VALDURA built by Russell & Co., Port Glasgow, in 1910, with engines by Rankin & Blackmore, Greenock. Rankin & Blackmore were based at the Eagle Foundry, Baker Street, which runs out onto Victoria Harbour. Could she have been there for something to do with her new engines? Did Rankine & Blackmore install engines at Victoria Dock? At more than 414ft VALDURA might have been a tight fit… Interesting question – where did Rankine and Blackmore crane their engines into ships at that time? (The Titan crane at James Watt Dock was completed in 1917). Another question is: was your 3 x Great Granda Uncle a sailor or a shipbuilder…? Thanks very much for the reply. You’ve given me some very helpful information. My knowledge of anything maritime is pretty pathetic, so I am grateful for you shedding a bit more light on this. I had already suspected that the Vanduara did not seem like the most likely of the options and the Valdura seems more likely as you have suggested. I did however have the same thought as you and wondered how it would fit inside the Victoria Harbour? Considering that I live in Greenock my knowledge of the Victoria Harbour and surrounding shipyards is not what it should be. My 3x Great Grand Uncle was listed as a ‘Labourer’ at the time of his death, so it was very much possible that he was working in the shipyards. He also lived at Arthur St, Greenock, which is very close to Baker St. He had previously been a Master Mariner and was listed as the Master of the ship ‘Ossian’ on the 1881 census. His brother Donald Graham was my 3x Great Grandpa, who was at one time the Captain of the SS Daylight, which ran aground on Jura during a storm in 1881. He later died in the Mariner’s Home in Greenock in 1919. Incidentally my Granda was the Chief Engineer on the King George V and I know that he used to make wooden yachts and sail them on the Murdieston Dam in Greenock. I don’t think kids do anything like that anymore. Even if you claim to be nautically challenged, you obviously have it in the bloodline. There are some fantastic old aerial views of the Greenock and Port Glasgow shipyards at the Britain from Above site that we used for the Silvers boatyard image above – click the link under that photo to start browsing. From distant memory of childhood trips to Oban, when ships seemed to have huge personalities, KING GEORGE V was a beautiful West Highlands steamer with twin back-topped red funnels. I also have a very distant ’60s memory of sailing from Dunoon to Tarbert, Loch Fyne, to visit a relative – how you got there then without a car – aboard the MacBraynes diesel “steamer”, LOCHFYNE, and being disappointed that I couldn’t keep warm by snuggling up to the funnel as on the PS JEANNIE DEANS, my favourite. The Firth of Clyde nowadays is a place deprived of these wonderful vessels, stolen by “change” and, of course, age. Long live the WAVERLEY. Great to hear from you, Mary. The strongest connection with the G.L. Watson story is with the Clark side of your family, one of the two Paisley thread making families – Coats and Clark – both serial patrons of the Clyde’s yacht designers and builders, especially G.L. Watson and the Fifes of Fairlie. Members of the Clark family owned two G.L. Watson designed yachts named Vanduara*. The predecessor to the 1886 steam yacht above was one of the earliest steel-hulled racing yachts, built by Henderson of Partick, Glasgow, in 1880 for John Clark. Her success signalled Watson’s arrival as a designer of successful racing yachts up to the largest size. Elizabeth Kerr Smiley’s husband, Sir Hugh Houston Smiley, was also a G.L. Watson client, commissioning the steam yacht Latharna** in 1897, built by Ailsa Shipbuilding, Troon. Latharna was slightly larger than the Vanduara pictured above, and was known as the first British built large steam yacht with an on-deck dining saloon. And a fascinating image at this link of her as the armed yacht HMS Monsoon during the first world war. You should also find a 6 May 1900 York Times reference to a Miss Katherine Clark and her new husband, Dr Lewis Rutherford Morris, chartering Latharna from June 1900 for their summer and autumn European honeymoon cruise. Could Katherine Clark be one of the Paisley Clark family that settled in New Jersey when the Clark mills were opened there? I haven’t looked into the Clarkes yet! My Gt gt grandfather Peter Kerr sold or was bought into Clarke’s/Coats cotton. But I do know that many Smileys trekked across the Atlantic and in fact Hubert Smiley died in New York Harbour (fell off or something) from the family yacht. 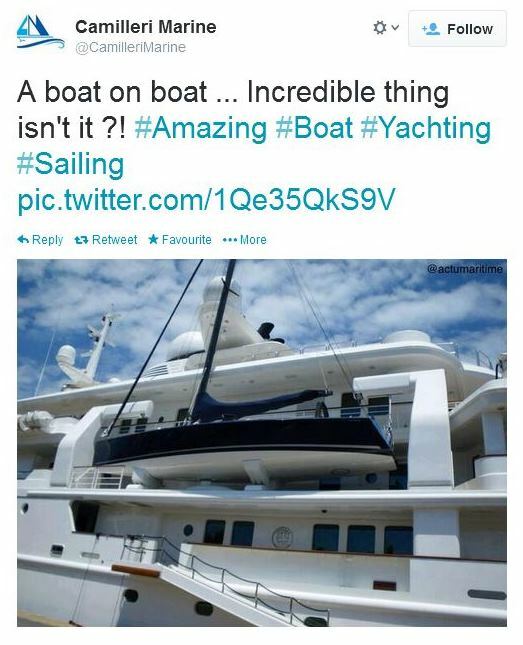 Maybe that’s why the yacht didn’t stay in the family too long. It certainly would have brought us to Australia!! Going to http://www.clydesite.co.uk/clydebuilt/search.asp, entering Smiley in the “Owner” box and pressing SEARCH reveals five earlier commercial vessels with launch dates ranging from 1829 to 1884, with either direct or most probably family connections to Hugh H. Smiley, and Larne and other Co. Antrim ports – including the iron steam ship Latharna, built 1884 by John Fullerton & Co., Paisley; wrecked Nova Scotia 1890. Actually, one other thing – do you think there are any drawings of the inside i.e. how many cabins etc there would be? Thanks Iain – I may have to wait til I retire to come and look at the records personally! I’ll contact G L Watson though, just in case. HH Smiley’s sister Annie married Stewart Clark and the Kerr,Smiley and Clark family were all intertwined both through marriage and business over several generations. 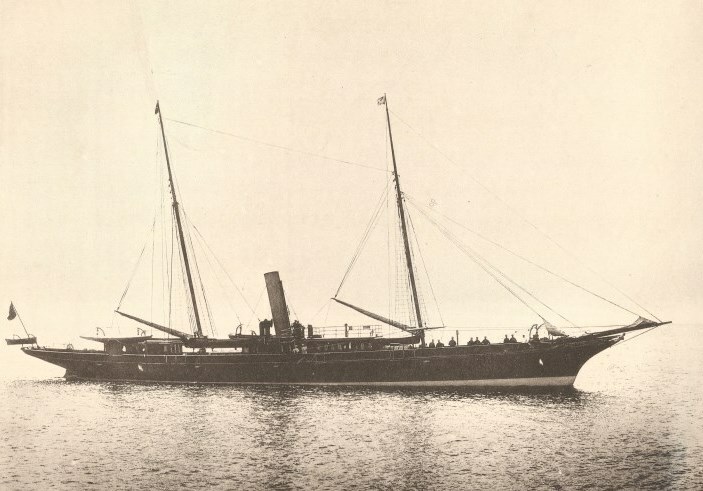 Latharna I think was eventually scrapped in Egypt but had spent much time travelling between Larne, Glasgow and New York where the family properties and businesses lay. Patrick and Mary, almost a year on… I noticed that today, 31 March, is the anniversary of the launching of not only H.H. Smiley’s steam yacht Latharna by Ailsa Shipbuilding, Troon in 1897, but also the commercial steamship he owned named Latharna, by John Fullerton & Co., Paisley in 1884. I wonder if there is any significance in that date?